Background: Angiogenesis is a crucial process that regulated by multiple intracellular signaling pathways including MEK/ERK and JNK/SAPK. Thus, many inhibitors have developed to these pathways as anti-cancer therapeutic strategies. Oleanolic acid (OA) is a natural pentacyclic triterpenoic acid compound that present in various herbal medicines. It has been used as antitumor agent for various cancers including colorectal cancer (CRC), which attenuates angiogenesis. Objective: To study the molecular mechanism of OA suppressing angiogenesis. Method: The proliferation of human umbilical vein endothelial cells (HUVECs) was determined by MTT and the invasion and migration of them were measured by wound-healing Assay, transwell migration assay and tube formation assay. The xenograft mouse model was used to study the effect of OA blocking angiogenesis in vivo. The Western blot was used to checked the phosphorylation of VEGFR2. Results: OA attenuates HUVECs invasion, migration, tube formation and vascular sprouting. Moreover, OA suppresses HUVECs sprout and tube formation. Importantly, OA also blocks angiogenesis in HUVECs and colorectal cancer cells (HCT-116) both in vitro and in vivo. OA-dependent suppression of tumor angiogenesis mediated by blocking the phosphorylation of the vascular endothelial growth factor receptor-2 (VEGFR2) that results in inhibition of MEK/ERK/JNK pathway. Conclusion: Our results suggest that inhibition of tumor angiogenesis via the suppression VEGFR2 phosphorylation may be one of the underlying mechanisms by which OA exerts its anti-cancer effect. 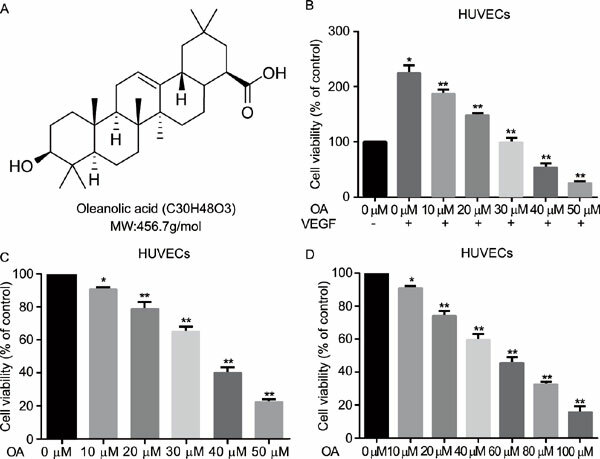 Oleanolic acid, angiogenesis, migration, VEGFR2 signal pathway, colorectal cancer, MTT.